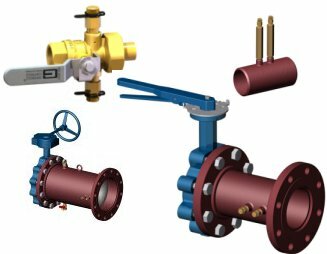 The QuickDisc® and QuickSet are manual balance valves that include brass venturi inserts for flow measurement and graduated memory stops for flow setting. Valves are available with multiple end connection options including a union end connections. The QuickDisc® valve uses a ceramic disc to control the flow and the QuickSet valves uses a ball to control the flow. Click here to see a video showing the ceramic disc’s performance. The 2-1/2″ to 20″ QuickSet and Metering Stations are equipped with a Quadrant Peizo Ring with four sensing ports for more accurate throat signal. No straight runs are necessary for normal operation. With the addition of a butterfly valve for shut off, the 2-1/2″ to 20″ Metering Station becomes a full functioning QuickSet Manual Balance Valve with memory stop for full accurate flow adjustment. Valves with accessory ports for additional accessories also available. Where flow balancing, flow metering, and shut-off are desirable in one valve.